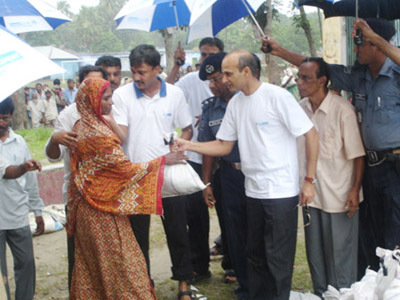 HCBL has started its relief operation for flood-affected people from 8 August 2007. Relief team consisting of company’s own employees is traveling by trucks and engine boats to submerged areas of Savar, Manikganj and Sirajganj everyday with hundreds of food units. In this endeavor, HeidelbergCement has found by its side, all its Channel partners and local retailers. These channel partners are earnestly supporting the company with their truck, labour and warehouse facilities for storing and packaging of food items. Local authorities such as Upzilla Chairman, TNO, DC and police force have extended their full cooperation during all our operations.